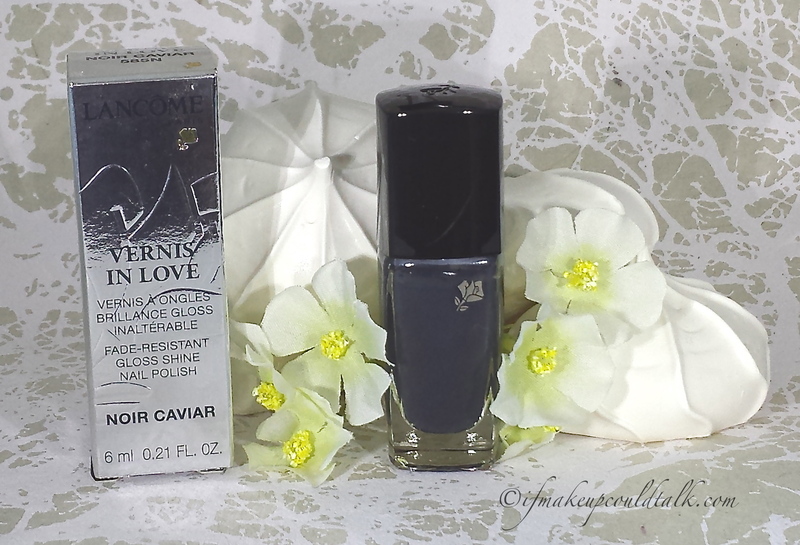 Home Brands and Products Lancome Noir Caviar 585N Vernis In Love. 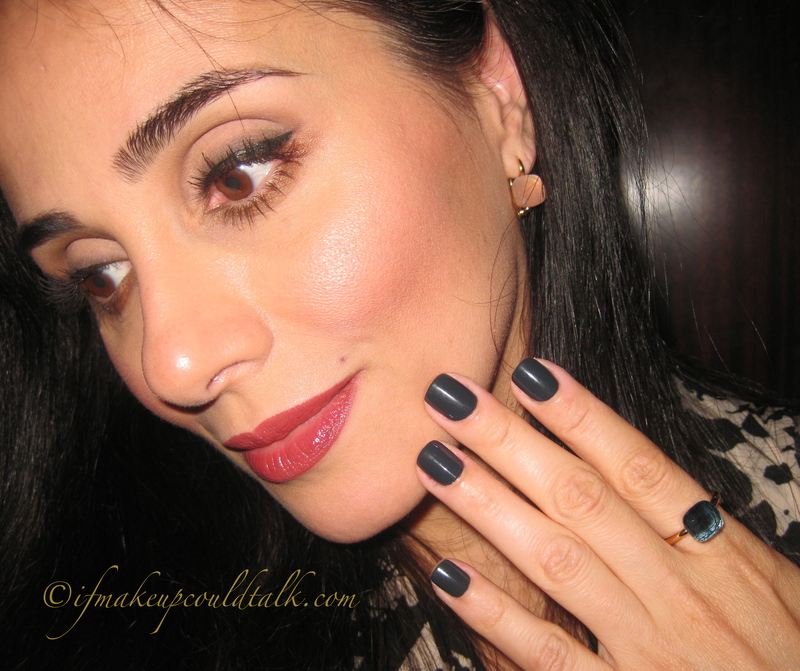 Lancome Noir Caviar 585N Vernis In Love review and photos. Lancome Noir Caviar 585N Vernis In Love brush. Beautiful dark deep gray cream with a hint of a teal/blue undertone–keeps polish from looking black from afar. Thin smooth consistency makes application a breeze. Settles evenly on the nails without any streaks. Opacity is reached using two coats (some may find one coat sufficient). Brush head will accommodate a variety of nail widths and lengths. Amazing wear–chip-free for 5-6 days depending on one’s activities. 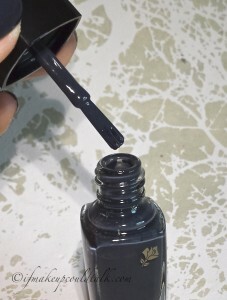 According to lancome-usa.com, “Multi-Polymers Complex provides a film that protects color and keeps nails perfectly polished.” For reference I use Revlon Colorstay Base Coat with Out the Door Fast Drying Top Coat. Easily removable with my trusty Zoya Nail Polish Remover. Not advertised as 3-free, but I could not find Formaldehyde, Formaldehyde Resin, Toluene, or DBP in the ingredients. Polishes are categorized in 3 moods: Letter M shades are brighter/daytime appropriate, Letter B shades are boudoir shades for cocktail hour (whatever that means), and Letter N shades are intense shades (my favorite category). Small compact bottle is easily stored. 26 colors offered with exclusive shades on lancome-usa.com. Lancome Noir Caviar 585N Vernis In Love (with flash). Amount (.21 fl oz) is well below what most standard polishes offer (.5 fl.oz.). Sephora does not carry the entire Lancome Vernis In Love color line. Noir Caviar 585N is listed on Sephora.com and Nordstrom.com as Noir Angora 585N, but my bottle (purchased at Sephora) clearly states Noir Caviar 585N. 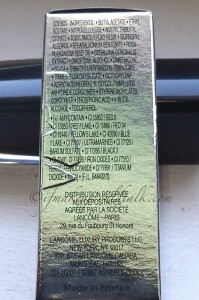 Lancome also lists this shade as Noir Caviar 585N. Lancome Noir Caviar 585N Vernis In Love (without flash). 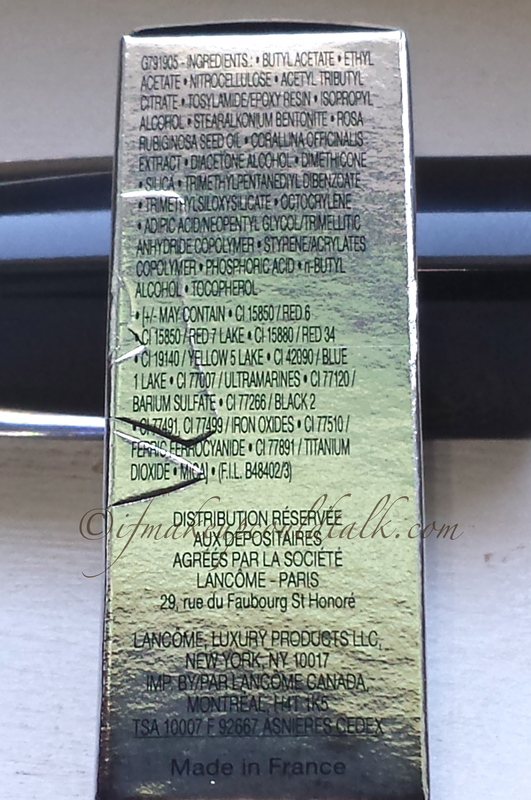 Lancome Noir Caviar 585N Vernis In Love ingredient list (click to enlarge). Lancome Noir Caviar 585N Vernis In Love can be found at lancome-usa.com, Nordstorm, Sephora, Saks, Bloomingdales, etc.. Makeup would tell you Lancome Noir Caviar 585N Vernis In Love is a must have shade/formula. I can honestly say this little bottle of murky goodness has made its way to the tippy top of my list as one of the best nail polish formulas..ever!! My next color(s) will be 473N Rouge Reglisse and then Marine Chic, etc.. I think it is safe to say, I’m officially “In Love” with Lancome Nail Polish. Be well, stay safe and be happy. Pomellato Pink Quartz Nudo Earrings with London Blue Topaz Nudo Ring. If you find yourself in NYC area, visit Pomellato at 64th street 741 Madison Avenue and ask for Marylu. She is truly one of the most patient, kind and knowledgeable sales associates ever! Jennifer Meyer Gold Leaf Earrings with Pomellato Sabbia Ring.